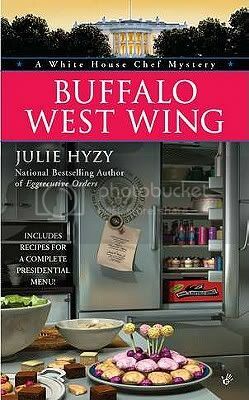 This is the 4th book in the White House Chef series. I have previously reviewed the first three books: State of the Onion, Hail to the Chef, and Eggsecutive Orders. Ollie had a good run in the White House kitchen under President Campbell. Mrs. Campbell, in particular, was a big fan of hers, which helped to shield Ollie during some of the more outrageous happenings. President Campbell decided not to run for a second term, however, which means that Ollie’s job situation is currently a bit tenuous, as she serves at the pleasure of the President and First Lady. When a mysterious box of buffalo wings shows up in the kitchen, addressed to the President’s children, Ollie makes the decision not to serve them, a decision that proves unpopular with the children and their mother. It turns out that Ollie may have saved the children’s lives, but as she has been forbidden to share this information with the First Lady, her job as Executive Chef remains in jeopardy. Buffalo West Wing has an interesting flow, compared with the other books in this series. Most of the dangerous mystery happens away from Ollie and the White House, other than the relatively benign appearance of the poisoned buffalo wings – although inevitably Ollie does get caught up in the drama eventually. Instead, the majority of the plot has more to do with the internal politics of the White House staff, as a potential rival is introduced for Ollie just when she is at her most vulnerable with a new First Lady. Perhaps the brightest spot is a returning character who becomes a possible new love interest for Ollie, something that was much needed after her breakup with Tom in Eggsecutive Orders. A slightly different entry in the White House Chef series, but still a strong one.